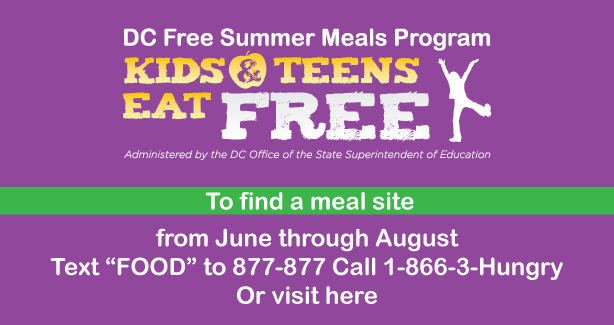 The DC Free Summer Meals Program is here! Find a summer meal site near you. Hunger doesn’t take a summer break. The US Department of Agriculture (USDA) Summer Food Service Program (SFSP), known in Washington, DC as the DC Summer Meals Program, provides reimbursement for free nutritious meals and snacks served to children 18 and younger. These meals help children in low-income areas get the nutrition they need to learn, play, and grow throughout the summer months when they are out of school. When school is out, the meals served as a part of the National School Lunch Program and School Breakfast Program are not available to all students, and due to families' limited budgets, or other circumstances, children will often miss wholesome meals. The Summer Food Service Program was established to fill this hunger gap and ensure that low-income children continue to receive nutritious meals when school is not in session.